Update: A Big THANK YOU to our supporters for making the yard sale a rousing success! We raised over $1,300 on Saturday, and combined with additional sales and donations brought in $2,504, enough to maximize the matching donation opportunity! 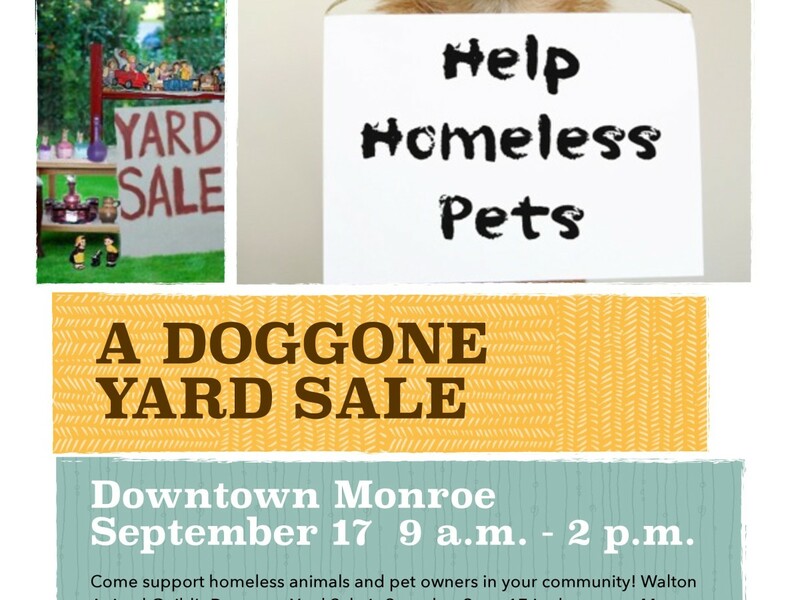 Get ready to do some shopping at WAG’s Doggone Yard sale on Saturday, September 17, 2016 in beautiful downtown Monroe. We’ll be at 227 South Broad St., (the corner of South Broad and Church St. across from Pinnacle Bank) from 9 a.m. to 2 p.m. with plenty of household and decorative items for sale. All sales proceeds go directly into our programs – rescue/adoption, spay/neuter and other community programs like the pet food pantry. And best of all – Woodmen of the World, a national business organization, has pledged to match whatever funds we raise at the sale – up to $2,500! An exciting opportunity to save more lives!